My day today was most definitely bought to you by the phrase “god give me strength”, and incorporated a range of stressful situations and interactions that had me ready to tear my hair out - if I wasn’t still sporting a killer blow wave. Seriously. Thankfully, recent research has shown that you don’t have to change your life to reduce stress, what you do need to do is change how you respond to it. By putting some key elements in place it won’t have as much impact on your overall health and nervous system. A supplement I should have been taking in the lead up to today is Blackmores Executive B Stress Formula, which is packed with vitamins, minerals and herbs to support the nervous system in times of pressure and tension. The specially formulated combination of B vitamins, magnesium and oats works to support a healthy response to stress and help to reduce nervous tension, containing herbs that are known for their calming qualities. Normal functioning of the adrenal glands and nervous system relies on B-group vitamins for the production of hormones and neurotransmitters. Vitamin B5 is important to the body’s ability to cope with stress because it plays a central role in the functioning of the adrenal glands. Similarly, folic acid and vitamin B6 are involved in the manufacture and effective action of mood-supporting hormones such as serotonin. Another Blackmores release specially developed for women is Women’s D-Stress, which combines essential nutrients with the herb withania to support energy production, adrenal function, and help to maintain a healthy nervous system. B-vitamins are in there combined with other nutrients that support adrenal gland and nervous system function, including vitamin C, zinc and magnesium. The B-group vitamins also participate in the metabolic processes by serving as co-enzymes in the conversion of carbohydrates, proteins and fats from the diet into energy. • Defuse negative emotions - think irritability, impatience, insecurity - by breathing deeply. • Respond to voice mails and e-mails at designated times during the day. 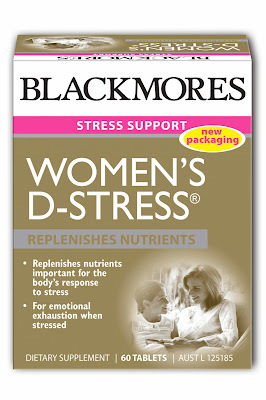 Blackmores Executive B Stress and Women’s D-Stress are in stores now - I know I’m going to start popping them, ASAP!